Smart businesses understand this and look for the best methods of presenting themselves as being successful. One of the first things they identify is the condition and appearance of their premises. Your premises are the focal point for creating a good first impression. Your customers will take a brief moment to assess how well your building and grounds are maintained before creating an opinion of what kind of business they are dealing with. We are less likely to develop trust with a new client, if we set foot into a well-operated business and the surrounding grounds and the building’s façade are untidy. Not many business owners have the time to carry out regular maintenance on their premises, nor do they have the correct equipment to be able to do so. Hiring a team of experienced Grounds Care Maintenance personnel will ensure your grounds give off the best first impression at all times. 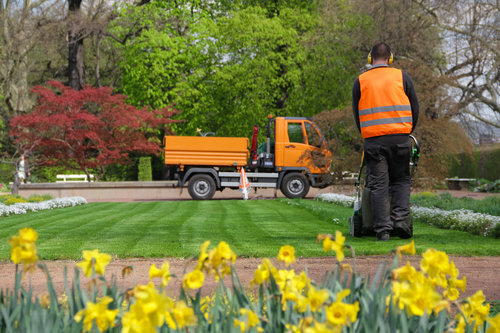 Unique Services specialise in grounds care with our highly experienced Grounds Care Division. We create extremely positive responses for clients, staff members and the general public by maintaining the highest standard of grounds care on your commercial property. Most of our high profile clients have been with us for 10 years or more, and are on a standard regular call cycle that is tailored to their specific requirements. Our Grounds Care Division visit on a weekly or bi-weekly rotation. However, depending on the size of the grounds, some customers require a monthly visit – the choice is yours. 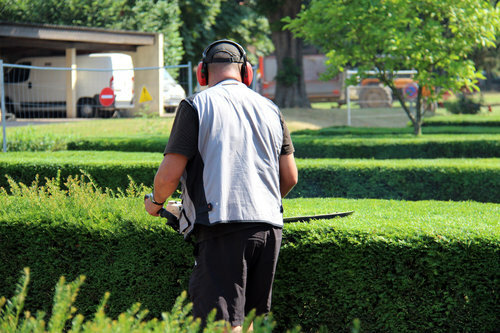 For everything within the grounds of your building space or office, Unique Services offer a wide range of services. When your grounds are maintained to a high standard, it shows your customers you are running an organised and efficient business. We recently joined the Grounds Care team for a day, to get a better idea of what types of tasks they carry out for our major clients on a regular basis. We started off at a major dairy plant with the first task being lawn mowing and edge trimming. This was followed by spraying the weeds in the surrounding gardens. To keep with Unique Services’ environmental care policy, this spraying needs to be carried out on a two to three week basis, as we use non-synthetic and sustainable chemicals wherever possible. The client had a number of bushes and small trees that were trimmed and shaped and our team advised this was done on a regular basis. The guys had an amazing ability to trim these trees fast while still managing to shape them perfectly. The next stop was a major shopping complex where the gardens are kept tidy, the plants trimmed and all rubbish collected and removed from site. From here it was over to a meat packaging operation where we were busy tiding up the shrubs and bushes at the front of the premises. Mark, the team leader, was also liaising with the client’s staff, for the felling and removal of trees that were starting to impinge on power lines. 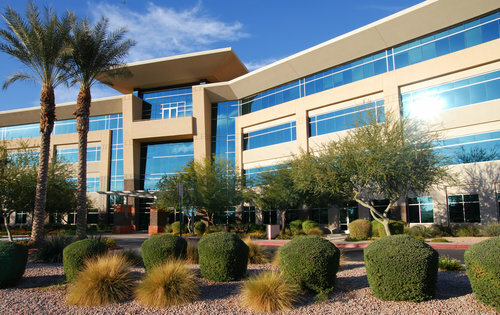 He also arranged for the Unique Services Building Maintenance Division to quote for cleaning and painting the exterior of the building that would be exposed when the trees were removed. Then we were off to a major security company for more lawn mowing, trimming and weed spraying with a little crown lifting on some large shrubs in their garden area. The last job of the day was a trip to the organic recycling plant to drop off all the cuttings and green waste that wasn’t able to be mulched into the areas that had been worked on. A very busy day, but there is no job too big or small for these guys to tackle! Give Unique Services a call today and get out Grounds Care team on board. If there’s ever been a way to creat a great first impression, you can count on us!